刘建奎, 范佳霖, 魏春华, 李艳, 刘佳悦, 马露露, 虞慧芸, 戴爱玲, 杨小燕. 猪繁殖与呼吸综合征病毒类NADC30毒株FJZ03的致病性分析[J]. 畜牧兽医学报, 2018, 49(6): 1241-1248. LIU Jian-kui, FAN Jia-lin, WEI Chun-hua, LI Yan, LIU Jia-yue, MA Lu-lu, YU Hui-yun, DAI Ai-ling, YANG Xiao-yan. 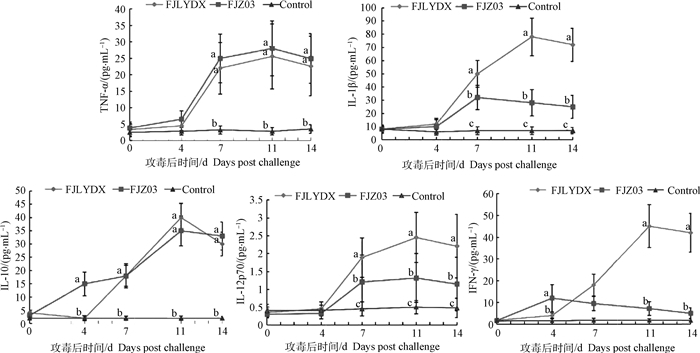 Pathogenicity of a NADC30-like Strain FJZ03 of Porcine Reproductive and Respiratory Syndrome Virus Emerged in China[J]. Acta Veterinaria et Zootechnica Sinica, 2018, 49(6): 1241-1248. Abstract: The aim of this study was to explore the biological characteristics and pathogenic of a NADC30-like PRRSV. Thirty days old piglets confirmed to be free of PRRSV and PCV2 were inoculated with a NADC30-like PRRSV FJZ03 strain and a HP-PRRSV FJLYDX strain, respectively. The clinical symptoms, rectal temperature, virus excretion, virus loads in the sera, and tissues lesions were monitored and recorded. 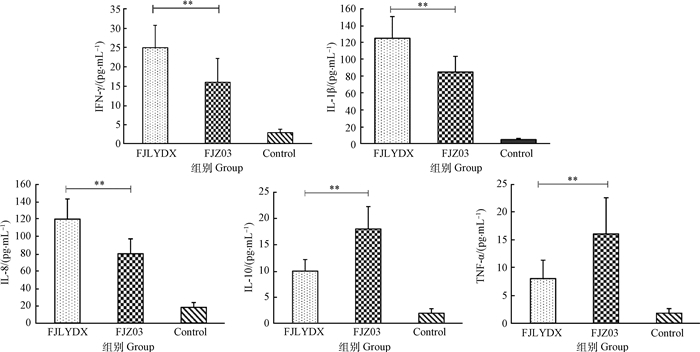 We found that FJZ03 strain could be rapidly replicated and developed higher titer of viremia in piglets. 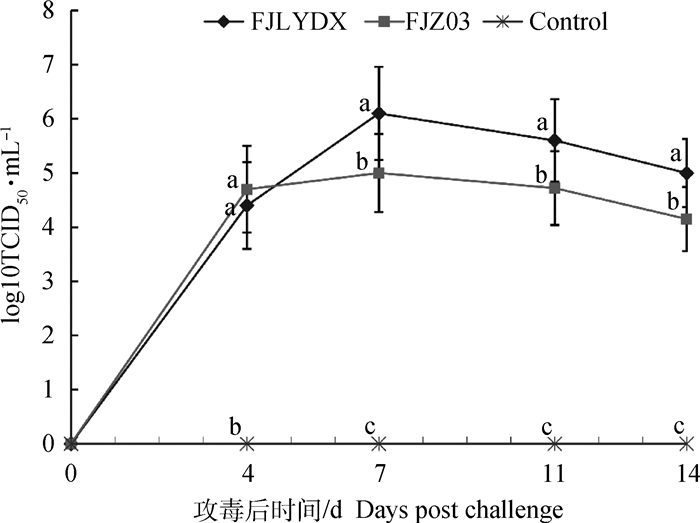 Moreover, the time of rectal temperatures rose and virus excretion in FJZ03 infected piglets were earlier than that of FJLYDX infected. 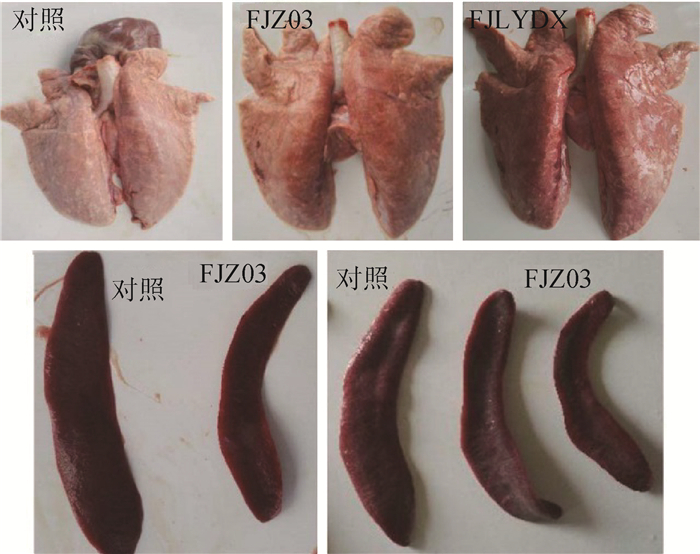 Furthermore, piglets infected with FJZ03 displayed severe interstitial pneumonia and spleen atrophy. 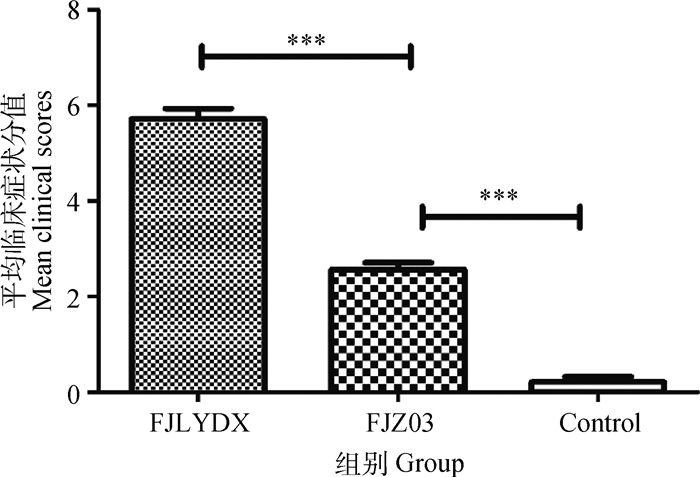 Cytokine test results showed that the cytokines concentrations of sera of FJZ03 infected piglets increased at different degrees. 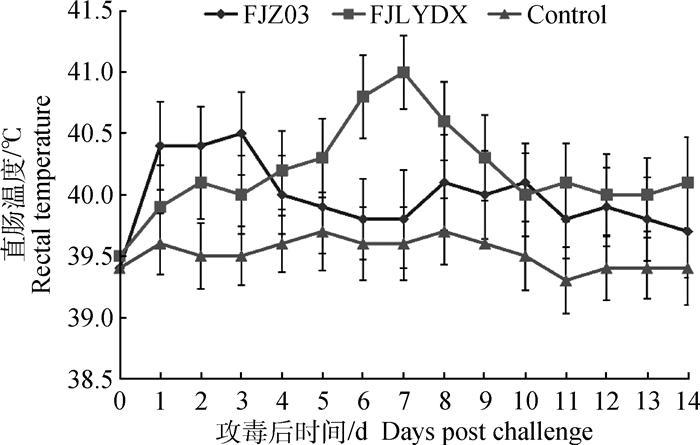 The IL-10 and TNF-α concentration in FJZ03 group was obvious higher than that of the FJLYDX group. 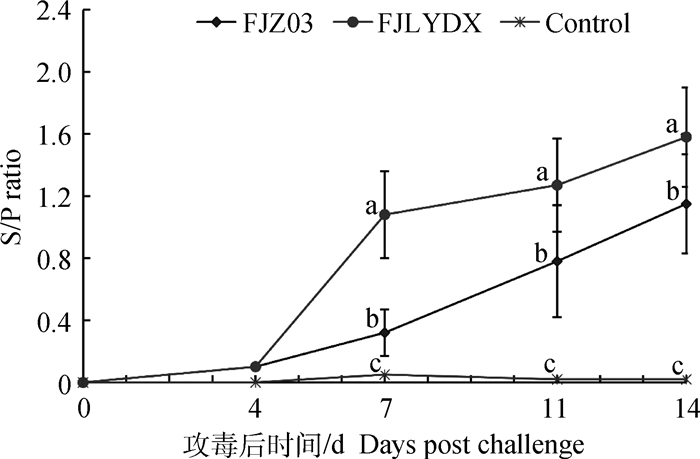 Therefore, our results indicated that FJZ03 is pathogenic for piglets. 魏春华, 刘建奎, 戴爱玲, 等. 福建NADC30-like PRRSV FJLY01株的全基因组分子特征分析[J]. 西北农林科技大学学报:自然科学版, 2017, 45(3): 51–60, 67. 冷雪. 高致病性猪繁殖与呼吸综合征病毒分离鉴定、遗传变异及致病性分析[D]. 北京: 中国农业科学院, 2012.